Injection Molding is the process of pushing or injecting molten plastic into a mold cavity. Plastic resin is fed into a heated barrel, mixed, and injected into a tool, where it cools and hardens to the configuration of the mold cavity. Lomont’s molding process is ideal for high or low production runs and can handle the challenges of complex geometries. There are six steps within Lomont’s Injection Molding process: Clamping, Injection, Dwelling, Cooling Mold, Opening, and Ejection. Each step has its own challenges, but each step is required to ensure that your molded parts follow the correct process. During the injection phase plastic pellet material flows into a hopper on top of the injection unit. The pellets feed into a cylinder where they are heated until they turn molten. A motorized screw, or ram, within the heating cylinder then mixes the molten resin and force the polymer to the end of the cylinder. Once enough material has accumulated in front of the screw, the injection process begins. The molten plastic is inserted into the mold through a sprue, while the pressure and speed are controlled by the screw. The dwelling phase provides increased pressure building within the injection process. Once the molten plastic has been injected into the mold, pressure is applied to make sure all the mold cavities are filled. This portion of the injection molding process helps to build the molded parts overall wall thickness. The cooling stage of the injection molding process allows the molded part to properly cool. Cooling times vary depending on thickness of the part wall. The mold separates as the clamping pressure releases. Once this occurs the mold is separated into two halves. The ejection of the mold is accomplished by using an ejection rod and plate to eject the newly generated high strength finished part. The unused sprues and runners can be recycled for use again in future production runs. 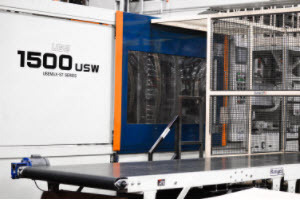 Contact us for more information on our high strength injection molding processes that reduce waste, or you can request a quote today.